[Nashville, TENN, (February 4, 2019] Louie Giglio, bestselling author and founder of the Passion movement, is set to release a new book, “Not Forsaken: Finding Freedom As Sons and Daughters of a Perfect Father” (May 2019, B&H Books), that helps readers embrace God as their perfect heavenly Father, regardless of their relationship with or absence of their earthly father. Giglio, pastor of Passion City Church in Atlanta and author of the national bestsellers “Goliath Must Fall,” “The Comeback” and “Indescribable,” has seen first-hand the challenges people have with seeing God as their perfect Father, especially if their earthly father was any less than perfect. Though every individual has a unique experience with their earthly father, Giglio says what unites is the need woven into every soul, “the need to be loved, and treasured, and noticed and accepted by our father.” Statistics show that more children than ever live without a father at home and the millennial generation, which Giglio has been reaching for years through Passion, has been called “the fatherless generation.” However, Giglio says this book is for everyone—not just those with “daddy issues”—because every Christian needs to discover more of what it means to be a loved son or daughter of the King. Since the first Passion gathering in 1997, Passion events have drawn over a million college students and reached students all over the world. Louie and his wife Shelley are passionate about calling a generation to leverage their lives for the fame of Jesus, and in addition to the collegiate gatherings of Passion Conferences, they lead the teams at Passion City Church, sixstepsrecords and Passion Global Institute. B&H will release more forthcoming trade books from other members of the Passion family, as part of an exclusive partnership between LifeWay and Passion Publishing. “It’s a profound privilege to help carry ‘Not Forsaken,’ one of Louie’s life messages, to the world, and we couldn’t be more excited to be in partnership with the B&H Publishing Group and their incredible team,” said Kevin Marks, Managing Director for Passion Publishing. 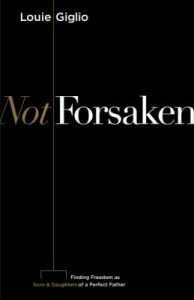 B&H is working collaboratively with Passion Publishing on “Not Forsaken” with a presale campaign, a national media tour, in store and online promotions supporting retail partners, promotions through Passion’s extensive social media platforms and multiple interactive media assets. Louie Giglio is Pastor of Passion City Church and the Founder of the Passion movement, which exists to call a generation to leverage their lives for the fame of Jesus. Since 1997, Passion has gathered collegiate-aged young people in events across the US and around the world, and continues to see 18-25 year olds fill venues across the nation in pursuit of lives lived for God’s glory. Most recently, Passion hosted 40,000 college students and their leaders in four venues linked together across three cities at Passion 2019. In addition to the collegiate gatherings of Passion Conferences, Louie and his wife Shelley lead the teams at Passion City Church, sixstepsrecords and the Passion Global Institute. Louie is the national-bestselling author of “Not Forsaken” (releasing May 2019), “Goliath Must Fall, The Comeback, The Air I Breathe, I Am Not But I Know I Am,” and “Indescribable: 100 Devotions About God & Science.” As a communicator, Louie speaks at events throughout the U.S. and across the globe. He is widely known for messages like Indescribable and How Great is Our God. An Atlanta native and graduate of Georgia State University, Louie has done post-graduate work at Baylor University and holds a master’s degree from Southwestern Baptist Theological Seminary. Louie and Shelley make their home in Atlanta. B&H Publishing Group, an imprint of LifeWay Christian Resources, is a team of mission minded people with a passion for taking God’s Word to the world. Because we believe Every Word Matters® we seek to provide intentional, Bible-centered content that positively impacts the hearts and minds of people, inspiring them to build a lifelong relationship with Jesus Christ. Among our print and digital releases for the trade, church and academic markets, titles include “The New York Times” No. 1 bestsellers “The Love Dare” and “The Vow,” No. 1 CBA bestseller “I Am a Church Member,” as well as the newly-revised Christian Standard Bible (CSB) version.